Better late than never... I finished up this cute little Christmas quilt. After almost no snow this winter we suddenly got six inches of snow last weekend, the perfect backdrop for a photo shoot. I cashed in some of my birthday chips to enlist my DH as a quilt stand. Good thing, it hasn't stopped snowing since and now we'd be buried under a snow drift! I started this quilt right before we left for Christmas vacation. I was in desperate need of some mindless sewing after all the deadlines and fussiness of my holiday sewing. 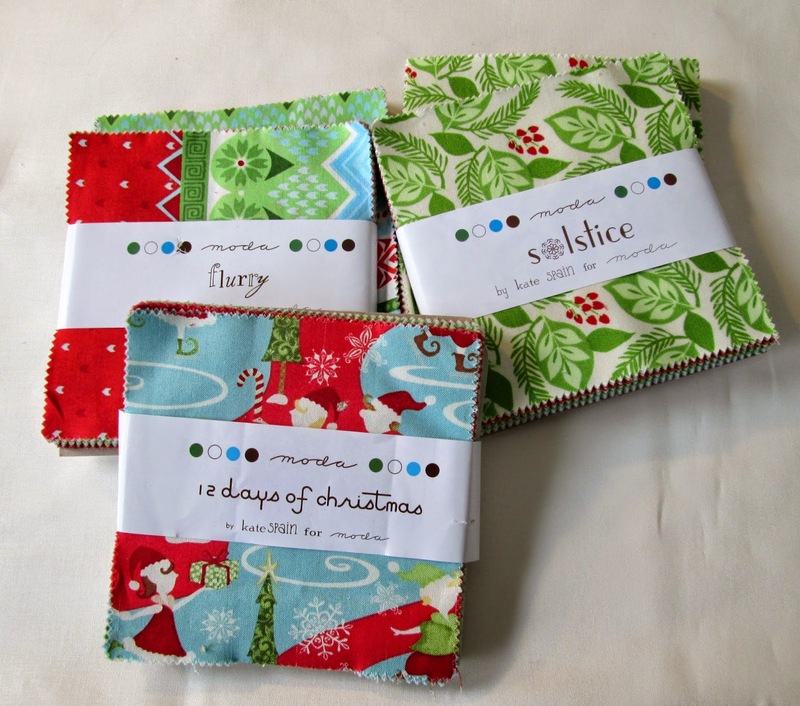 I sported this collection of Kate Spain holiday charm packs in my stash and got sewing. I didn't want to deal with anything complicated and wanted to use up as many charms as possible. I just randomly grabbed pairs of charms, sewed them together and then stuck them on the wall. 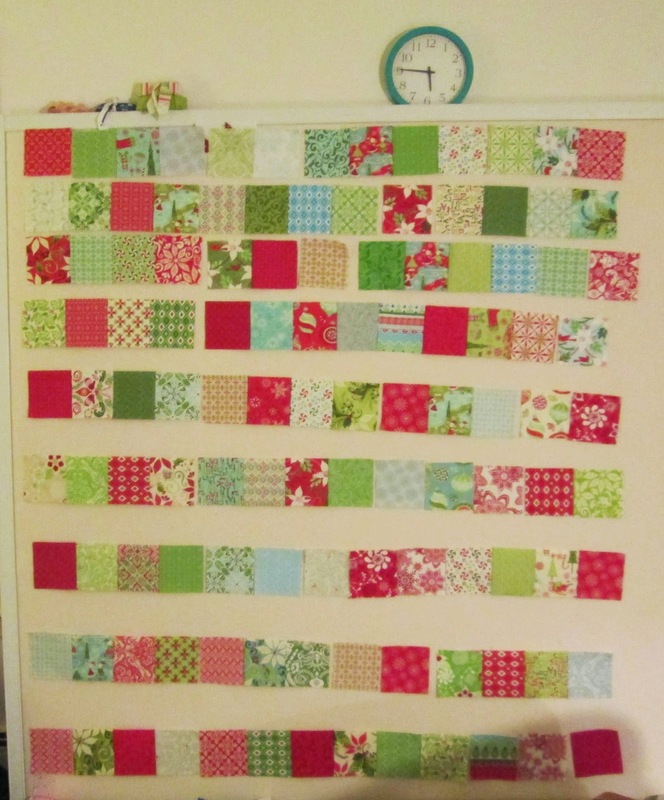 Without getting too thinky about it I just kept sewing pairs together into bigger units until I had strips of 12 blocks which seemed like a good throw size. To stretch things and give all the prints some breathing room I alternated with solid white squares on the odd rows. I love the almost gingham effect it adds with minimal effort! For the quilting I just went with straight lines a 1/4" from the seams. It was a bit tedious but was helped along by the final season of The Closer. 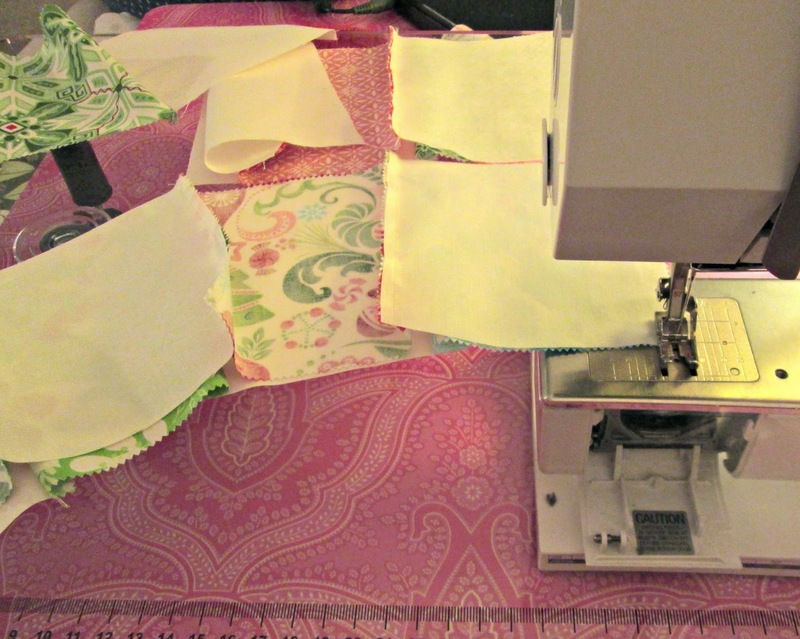 Linking up to the fabulous Finish it Up Friday by Crazy Mom Quilts and making my first check on the 2015 Finish Along with On the Windy Side. 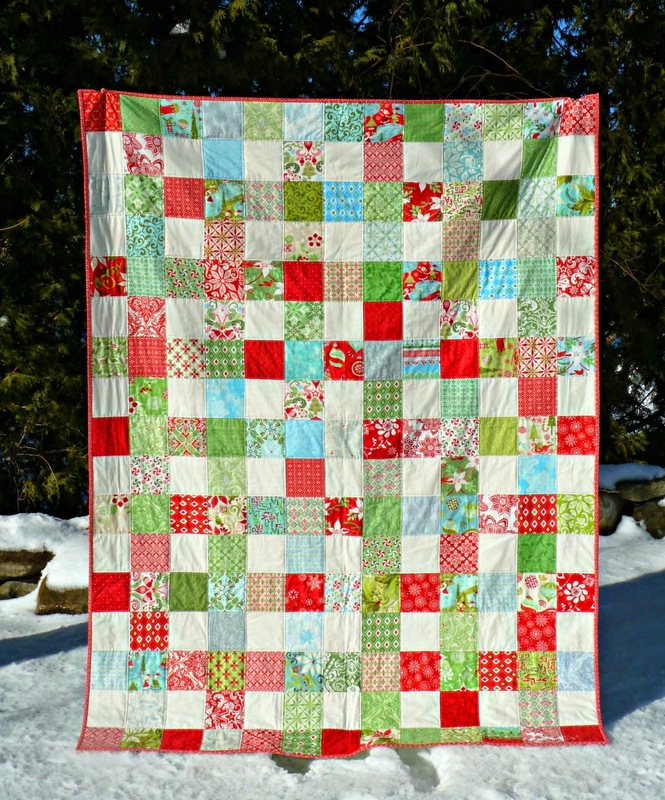 Finished quilt is 58" x 76"
Fabrics: Solstice, Flurry, and 12 Days of Christmas charm packs by Kate Spain, FSDS Mist. Thread: 50 wt. Aurifil in Light Beige (2310). Lovely! Those quick and mindless projects are just what we need sometimes! And the snow makes it seem like it's still Christmas, so perfect! Of course, let us not discuss that we still have our Christmas tree up. Your use of the white squares makes this just right. I love the plaid/woven appearance your block placement creates. What a wonderful quilt for next Christmas! 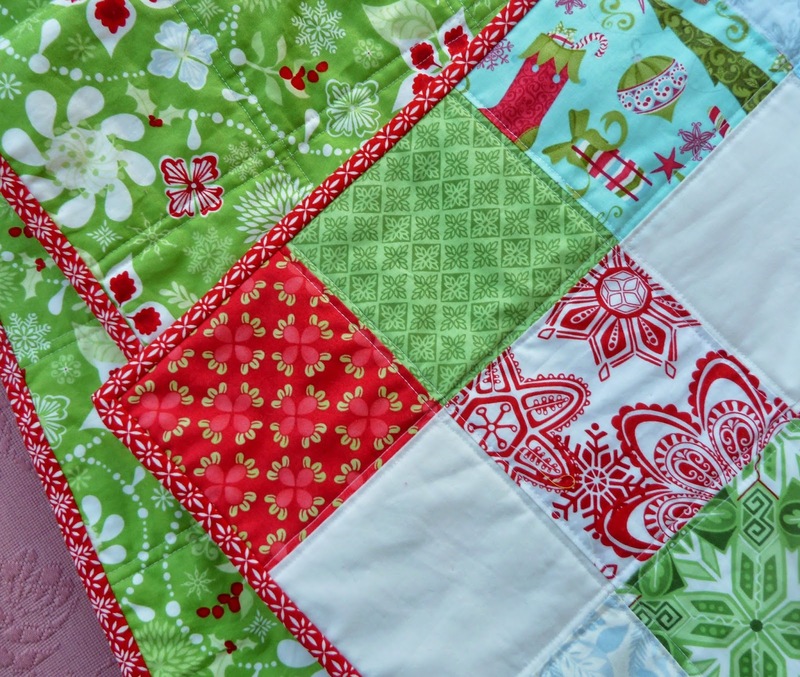 This is a wonderful Christmas quilt! I love this Kate Spain collection and the gingham effect really works! Very nice, Alice. I like the way you used the white squares. It makes the fabrics stand out. great quilt! xmasy but not too xmasy! You just can't go wrong with Kate Spain! The checkerboard is such a classic and effective design; great work!